Posted by Pam R in Recipes. 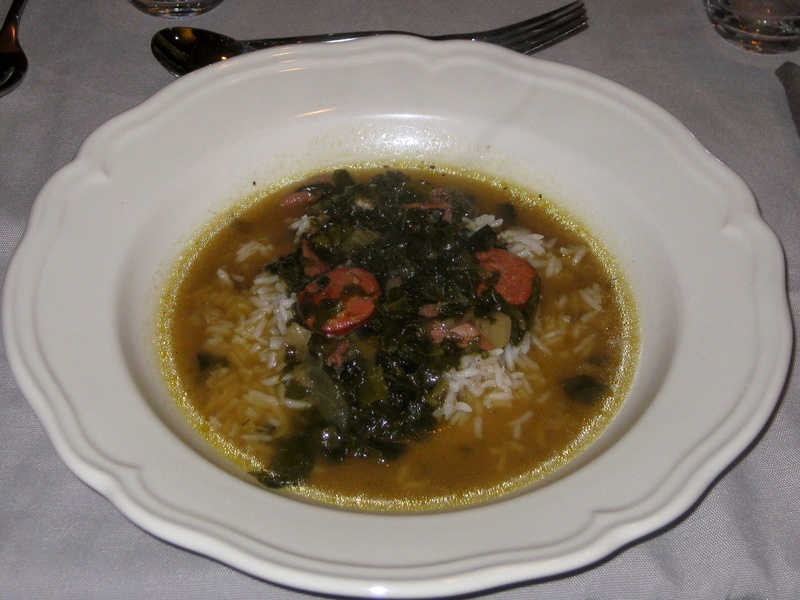 This recipe for Green Gumbo was served at the New Orleans dinner, and was adapted from a recipe by Hank Shaw. I made one change to this recipe. I boiled the ham hock for about 40 minutes and then cooked the greens in the same water for about 10 minutes before straining them out and using 10 cups of the resulting stock instead of the water in the recipe. That method was recommended in several other recipes, so I thought I would try it. This was the main course of the coconut-themed dinner. Unlike my entree, I used a lot of recipes and didn’t follow any of them very closely. The flavours came from this baked risotto. The quantities of rice/stock/coconut milk from this coconut and asparagus risotto (which sounds delicious) although I did 1.5x the quantities for 6 servings. The method came from this slightly pretentious article. The idea to cook the risotto to about 75% beforehand and then ‘finish’ it later came from this site (as did the warnings against doing so). In a heavy based pan sweat the onions in the vegetable oil – this should be done on a low heat and it should take about 10 mins for the onions to become translucent. You don’t want the onions to brown so keep them moving – the risotto stirring starts now! Put about half your stock in a saucepan until it starts simmering – keep it on a low heat. Turn the heat up and add the rice, stir to cover in onion and oil and to start toasting the grains – apparently this is the key to reducing the risotto cooking time – I don’t think I cooked the rice for long enough here because I was worried about burning it. Now the risotto making begins in earnest. Add a ladle of warm stock to the rice. Keep stirring until all the stock is absorbed. Resist the urge to add more stock until the previous ladle is completely absorbed. Keep adding stock, keep stirring. Every so often top up the stock in the saucepan, keeping it at a simmer. I kept this up until I’d used about 1.8 litres of stock. I then turned it off and quickly ladled it out and spread it on about 8 or 9 plates to cool for about 10 minutes and then put it in the fridge. When I got to Laura’s I tipped the risotto back into my heavy based pot. It still looked pretty good. Nice and glossy and starchy and creamy. It quickly absorbed quite a lot of stock (approx 600 ml), however I knew I still had 1.5 cups of coconut milk to add and I felt like it was starting to overcook. 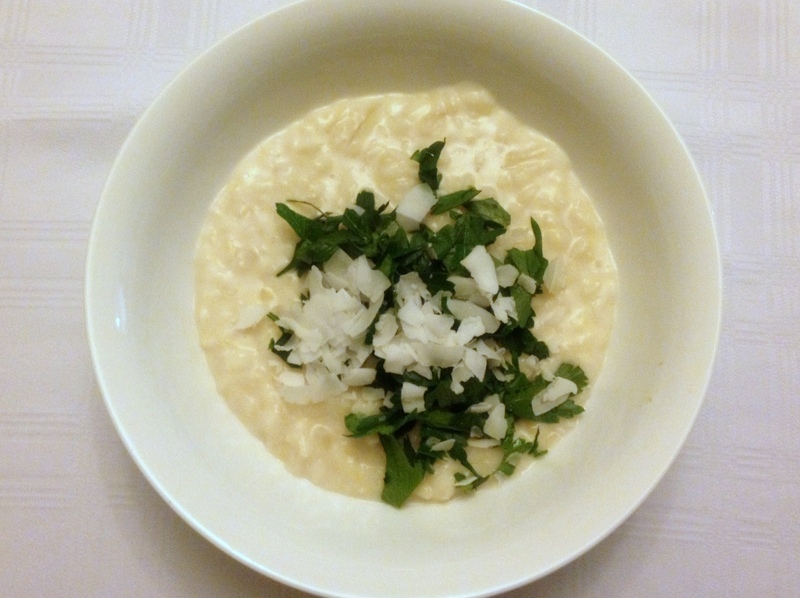 I then added the coconut milk (straight from the tin) and my beautiful creamy risotto turned to thick porridge! After all that stirring! Anyway – I kept stirring but it didn’t look like it was going to reduce so I added the lemon juice, zest and parmesan. I gave it a fairly vigorous stir and then served it topped with the chopped parsley and coconut flakes. It tasted delicious and the flavours were good but the texture wasn’t quite right for me. I wonder if heating the coconut milk would have helped and/or making the risotto in one go. Anyway I’d definitely make it again. 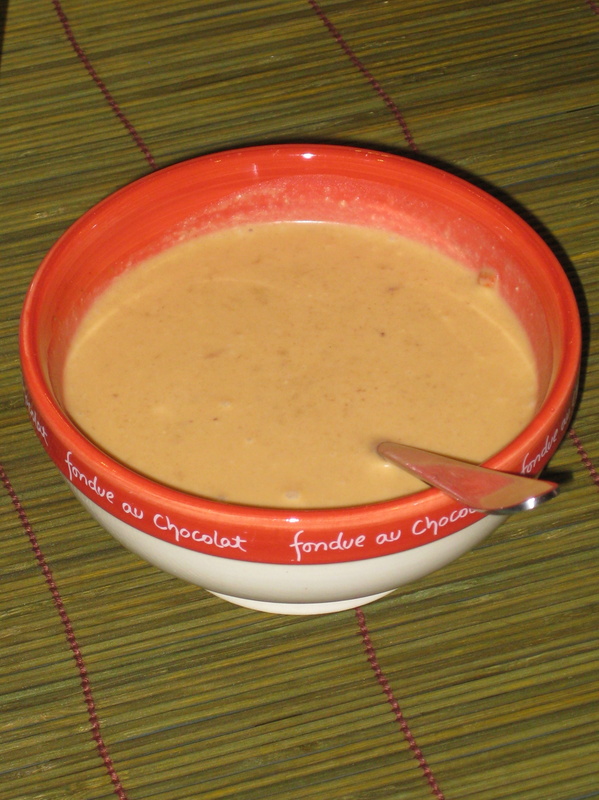 This was the dressing for the Goedangan salad from the Obscure Country dinner, and is a mixture of a few recipes. This is what I think I did. Fry together all the ingredients except the coconut milk. Take off heat and mix with the coconut milk. I also made fluffy naans using this recipe. I didn’t need any extra flour/milk/butter. When mixing your wet and dry ingredients it feels sticky for a while but will all of a sudden come together so give it a chance before adjusting your ingredients. 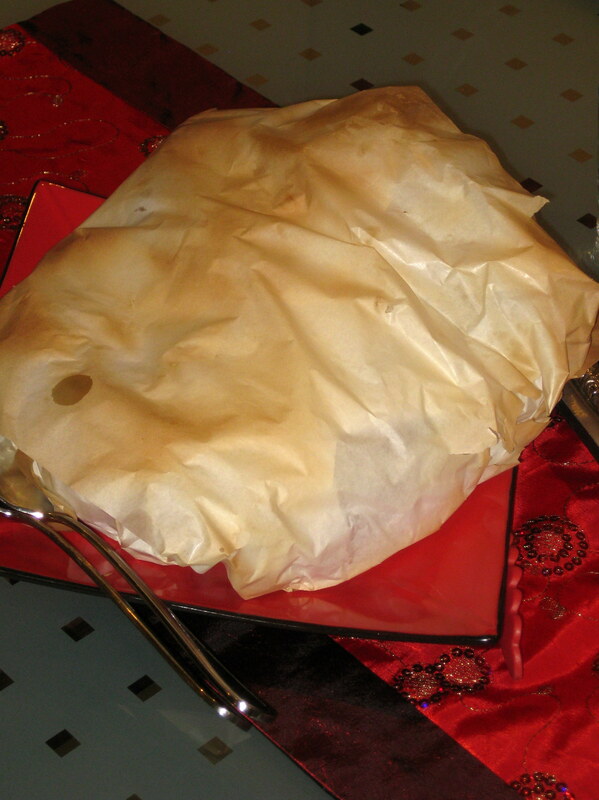 I did look at quite a few other recipes which influenced some of my cooking methods. Firstly I did a “cold prove” and let my dough rise in the fridge all day and got it out of the fridge an hour before kneading it again. Once I kneaded the dough, I formed it into a ball and then slightly flattened it and then cut it into 12 wedges like a cake (cut into quarters and then each quarter into 3 slices). I left these uncovered on a plate for about 30-40 mins before rolling out. I didn’t use a rolling pin but just my hands to pull out into a flat ‘tear-drop’ shape. Don’t worry if you get a hole in the dough or if it is a bit uneven. I wet one side of the naan with water (some recipes say butter) and then placed the wet side down in a very hot buttery non-stick fry pan. 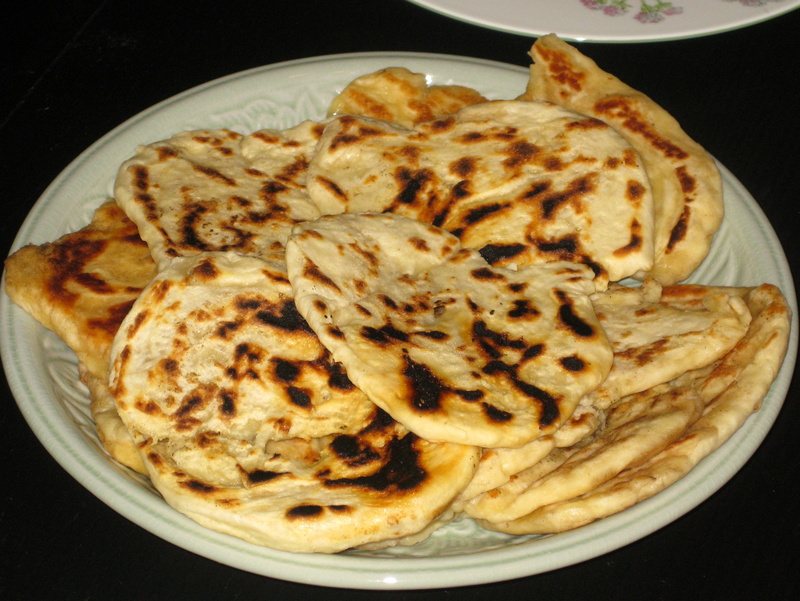 I would suggest omitting the butter as the naans that fried in a dry pan were much more authentic looking. None of my naans bubbled up. I cooked them for approx 2-3 mins on each side. 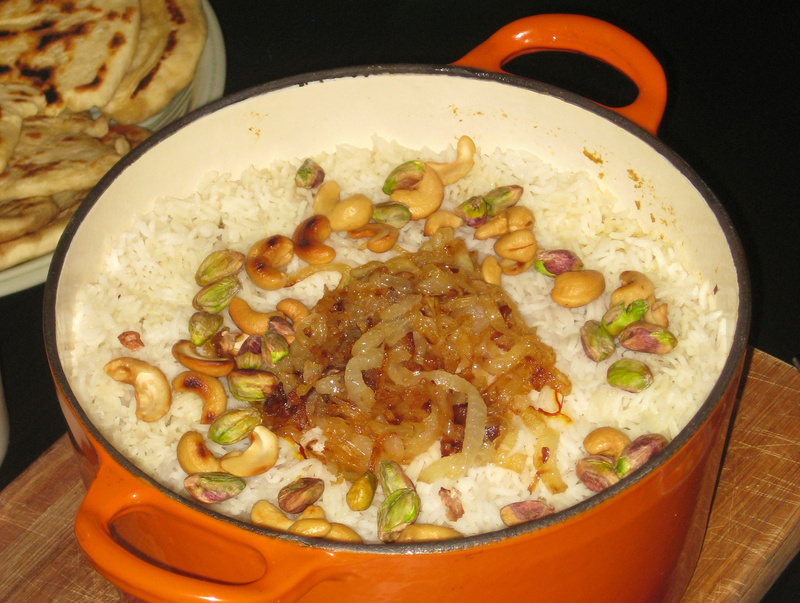 The biryani (from the Fluffy dinner) is a Rick Stein recipe from his book Rick Stein’s India that is also on the BBC website. I followed the recipe fairly closely but used a hot curry powder instead of the Kashmiri chilli powder (because I didn’t have any) and I also forgot to add the bay leaves. The chicken mixture took closer to 30 mins for the marinade to reduce. If I was making again I probably wouldn’t bother deep frying the onions I would just pan fry and I would probably add another onion (I used 3 large onions and I would have liked a bit more). I would also add another 250-500gms of chicken as I really didn’t think there was enough for the amount of rice – the marinade was plentiful so you wouldn’t need to double the marinade if you increased the amount of chicken. I would also increase the amount of nuts and add these to the chicken layers. This was one of the main dishes from the Meal in a Glass night from February 2012, and was based on this recipe at taste.com.au. These were easy to make and very moist and tasty but I omitted rolling them in sesame seeds (from sheer laziness). 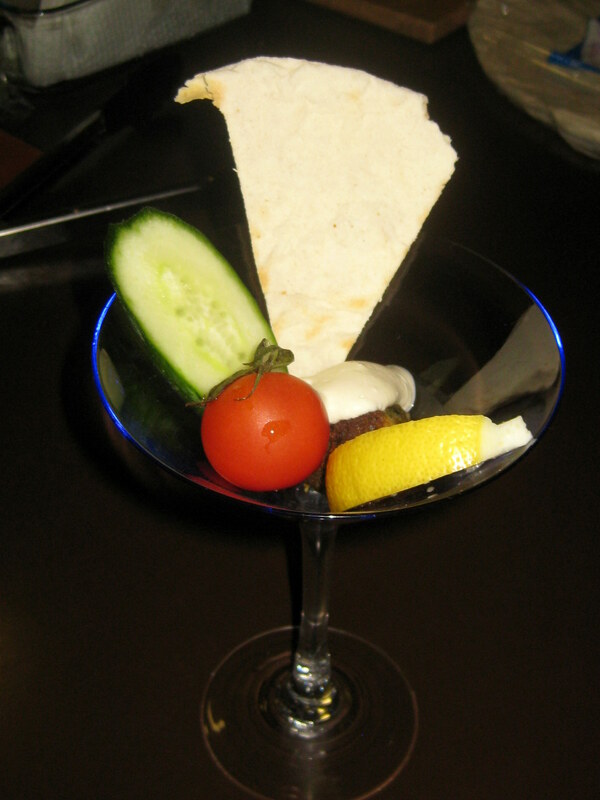 I served these in a martini glass with a wedge of cucumber,a wedge of pita bread, a wedge of lemon, a cherry tomato and a tahini dressing. I combined yoghurt, tahini and lemon juice to taste. 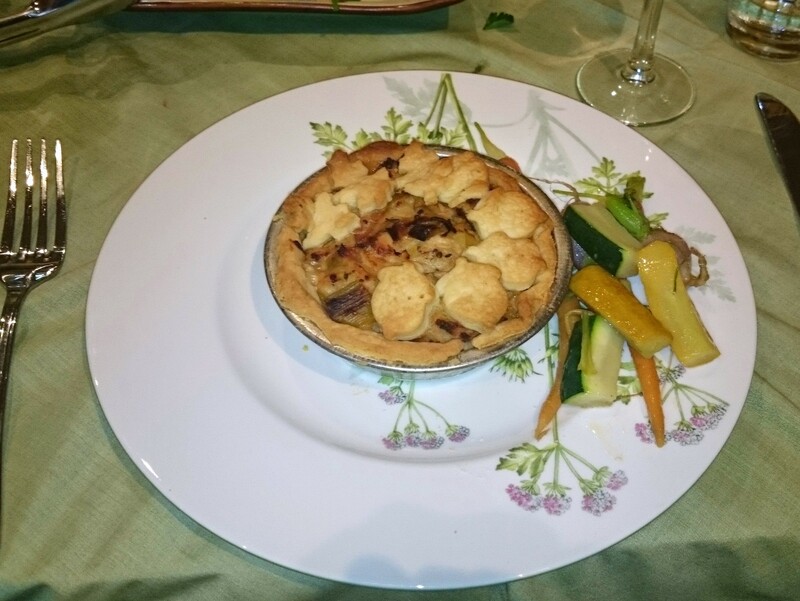 This was the main course for the Vinegar dinner, and comes from the May 2013 Women’s Weekly magazine. I used 2x 1kg chickens and I doubled the marinade. 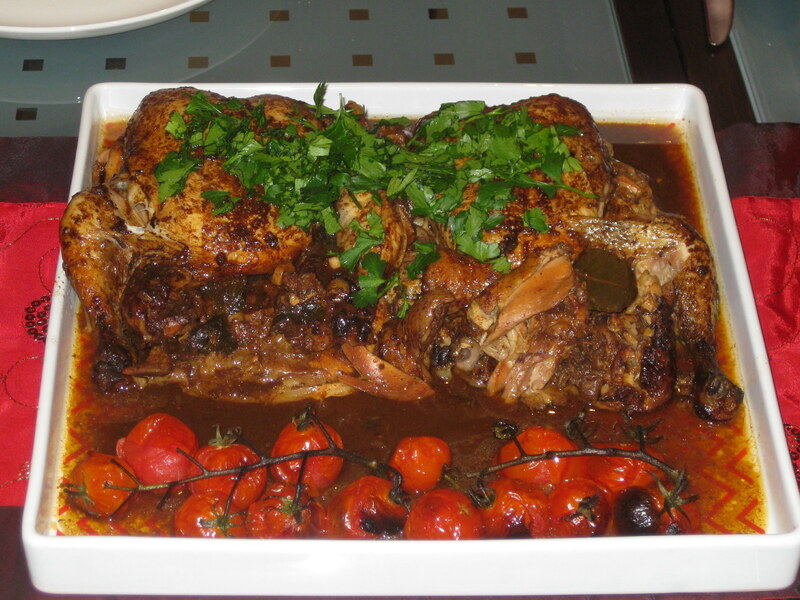 The thighs and drumsticks were the tastiest so you could make this with 2kg of bone in thigh fillets if you’d prefer. Place half of the herbs and all other ingredients except chicken in slow cooker. Stir to combine. Place chicken in slow cooker and turn to coat. Cook in slow cooker on low for 6 hours. Remove chicken and keep warm. Tip sauce into frypan and skim off fat. Reduce sauce by half. Pour sauce over chicken and scatter with remaining herbs. Serve with roast tomatoes and salad greens. This was an accompaniment to the main course in the Vinegar dinner, and is largely based on the Delia Smith recipe at BBC Food Recipes. I was a bit confused about her instruction to cut off the roots but assume that celery in Australia is sold with roots and tough outer layers removed. I would also suggest baking for a bit longer and cutting the celery stalks in half lengthwise to ensure even cooking.